What traditions have Poles enjoyed at different times of the year? 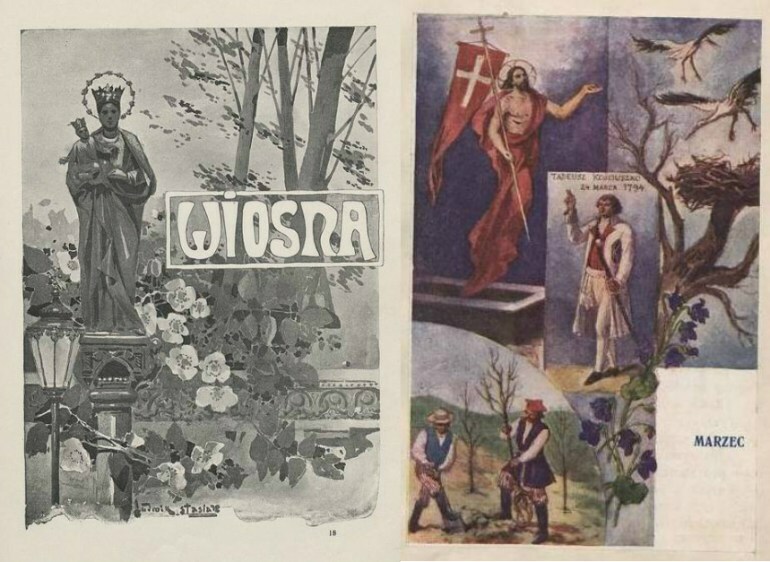 Let’s find out by looking at how classic Polish painters depicted them, and see how Christian, pagan, secular and other traditions mixed and merged in Poland’s calendar to create a unique and picturesque culture. What better way to start the new year than wandering from house to house, dressed up as a stork, a bear, a goat or even, the scariest of them all, a Turoń? This was part of the ancient Slavic tradition of ‘kolędowanie’ which marked Christmas time and stretched all the way into the beginning of the New Year. 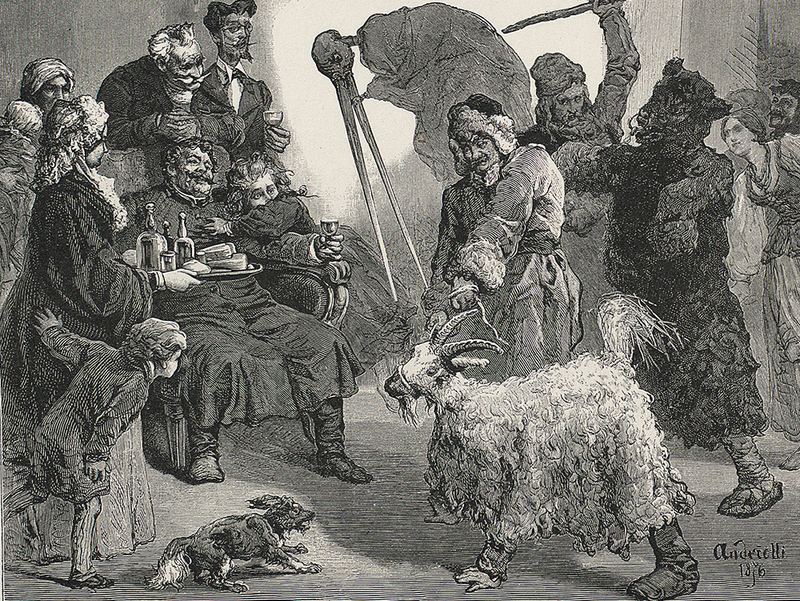 These visits included singing carols and were a way to wish prosperity unto a household in the coming year, in exchange the participants were offered scraps of food or a little money, as shown above in the illustration by Michał Elwiro Andriolli. Carnival, known in Poland as zapusty, started traditionally on the Epiphany, or Three Kings Day (6th January) and lasted until Ash Wednesday. This time of merry-making and jolly celebration was marked by festivities and dancing balls, however one of its most picturesque traditions was a kulig, known also as sanna. Usually organised during the last week of the carnival, a traditional kulig was a favourite with Polish landed gentry. It traditionally included a cavalcade of horse-pulled sleighs and sleds which went from one manor house to another, accompanied by music and singing in celebration around a bonfire. In the olden, snowier days, a travelling kulig-party like this could last for a week or even more. 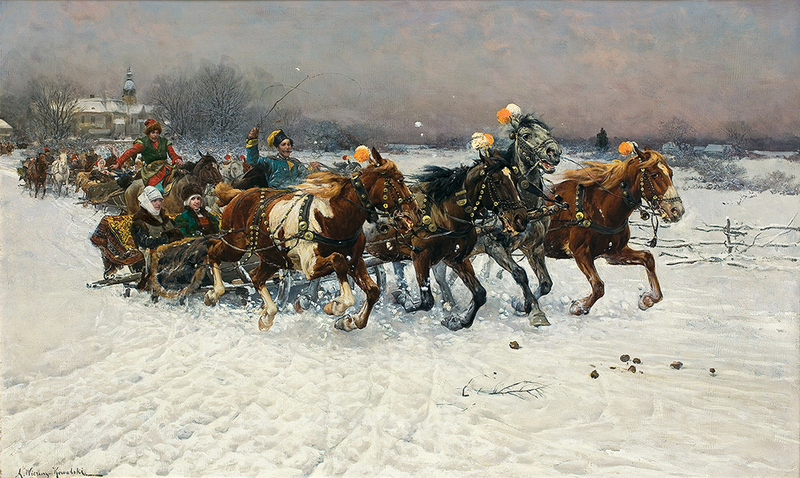 Kulig and sleigh rides in general were one of the favourite topics of Polish painting. Traditionally, that is meteorologically, spring starts somewhere in March. As you can see in the image above, in Poland this is the time that storks, an avian Polish favourite, arrive after a winter spent in warmer destinations. People also return to work on land to take care of their plants and crops after winter. And you can also see some religious festivities ahead. Lent which inevitably followed the carnival led to Wielkanoc (Easter). In Polish tradition, this meant a Holy Procession announcing the Resurrection, an Easter breakfast on Saturday, with an obligatory food basket blessed by the priest (so-called święconka), with decorated eggs (pisanki) and an Easter palm. But then of course, the infamous Śmigus Dyngus on Easter Monday. 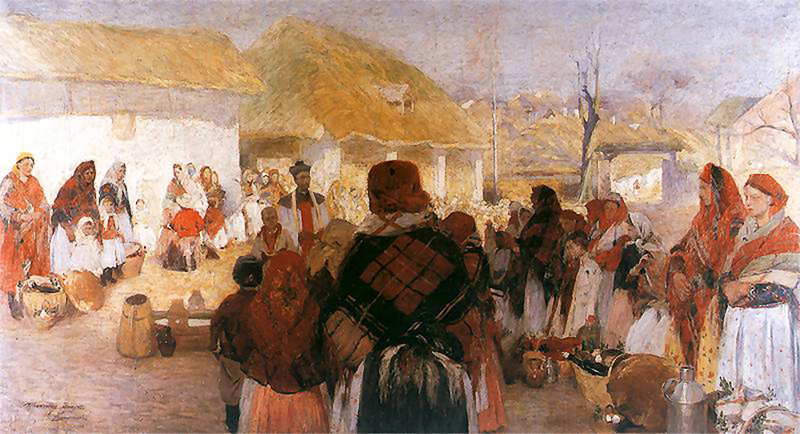 Włodzimierz Przerwa-Tetmajer painted his vision of an Easter celebration in the village of Bronowice, just outside of Kraków. Zielone Świątki, or Green Week is an ancient festival most likely of pagan origin, celebrated in May or June. This was a kind of spring rite, where people celebrated the powers of nature – it was customary to burn fires, and decorate houses with green branches and flowers in an attempt to secure crops. In more recent times (though still more like in the 19th century) religious processions marched around fields which were previously sowed, religious songs were sung, and holy paintings were taken on parade. 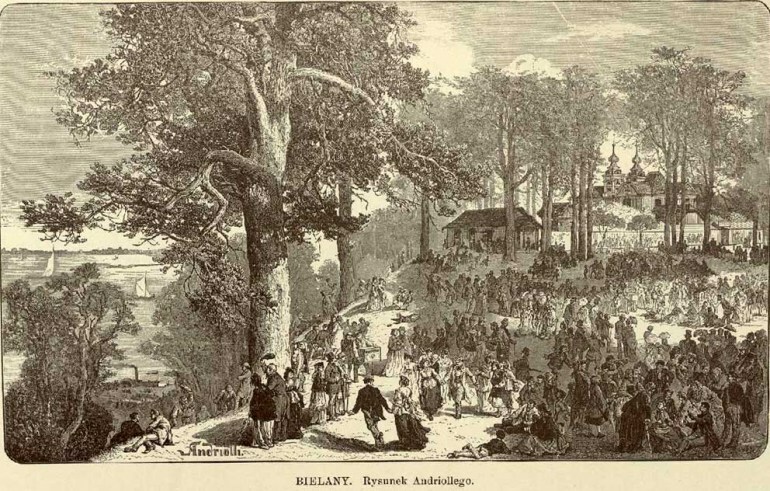 In cities and towns, people made excursions to the countryside (in Warsaw, the traditional destination was Bielany, as pictured above). In modern-day Poland, Green Week is celebrated along with Pentecostal Sunday. A month or so later, and it’s another ancient Slavic festivity. 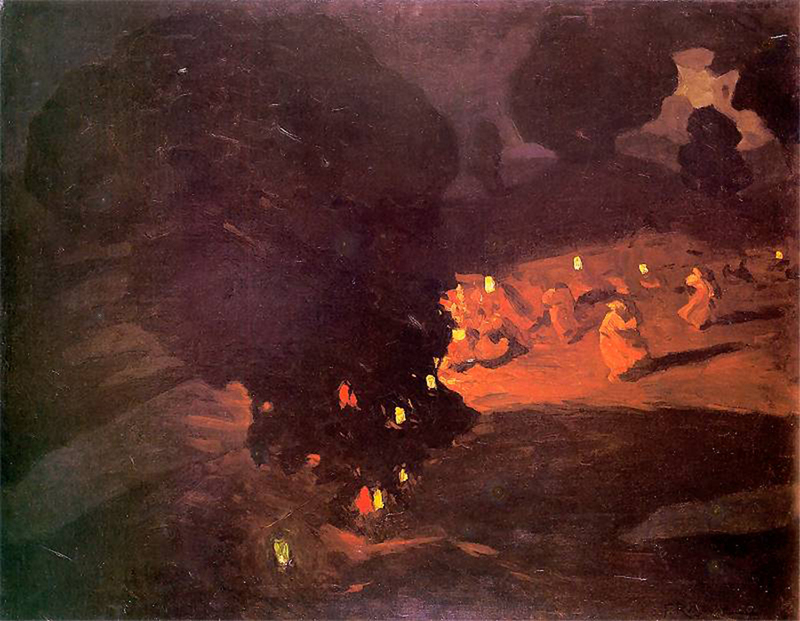 Known as the Sobótka or the Night of Kupala, this mysterious ritual marked the shortest night of the year (the Midsummer in Britain, in Poland it later got mixed in with the Christian Night of Saint John). It was a night of fortune-telling, setting bonfires and jumping over them. Young boys searched for the legendary fern flower (which was supposed to bloom on this night only), while girls floated wreaths of flowers (often lit with candles) on rivers. But, just as in the painting by Ferdynand Ruszczyc, what really happened on these nights, nobody knows. That being said, there are some people who are trying to bring the Slavic Faith back to increase our knowledge. Is there any particularly benign time of the year to get married according to Polish calendar? Obviously any time is good to fall in love and get married. The traditional folk wedding was a complicated and loud ritual, with its different phases reminiscent of classical rites of passage. 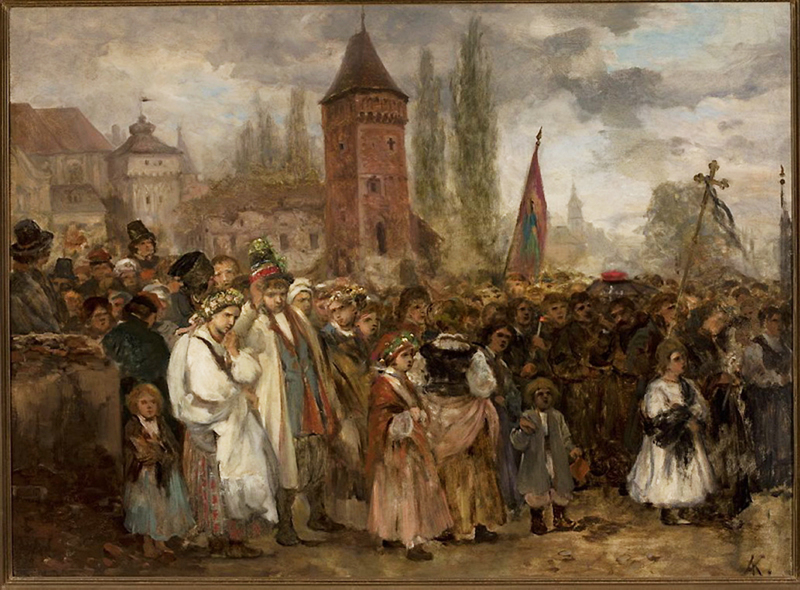 The painting by Aleksander Kotsis combines the image of newlyweds with a funeral procession (note the coffin in the right hand corner), in an attempt to symbolically link the everyday with the historical tradition of the uprisings (note the white eagle painted on the coffin and a red ‘confederate’ hat on top of it). Dożynki is a traditional harvest festival which in modern times is usually celebrated on one of the Sundays following the end of the harvest season, which in Poland falls in early September. Most often the peasants would gather in the fields outside their village (but as you can see in this painting by Michał Stachowicz it could also take place in front of a manor house), form a procession and bring back a sheaf or the last batch of cereal reaped from nearby fields. The wreath symbolises a rich harvest. The historically multi-cultural make-up of Polish society made it a melting pot of different ethnicities and traditions. 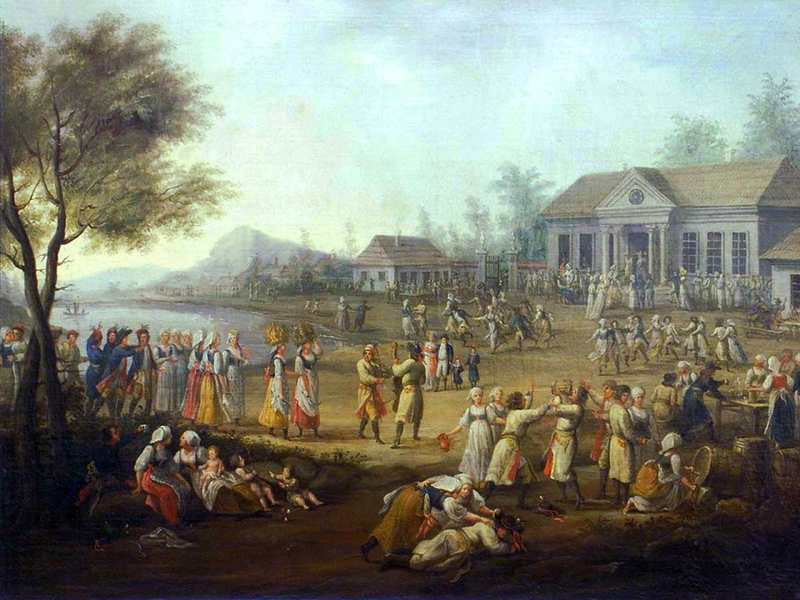 This painting by Aleksander Gierymski shows the Jewish holiday of Rosh Hashanah (the Jewish New Year) on the banks of the River Wisła in Warsaw, a city which for many centuries was home to a large Jewish community. The purely secular tradition of mushroom picking has always been strong with Poles who even today, in late summer to late autumn, venture into the woods in search for the biggest and most delicious specimen of fungi. They will later cook it and eat it. But don’t try this on your own – cooking mushrooms requires expertise and can be deadly. 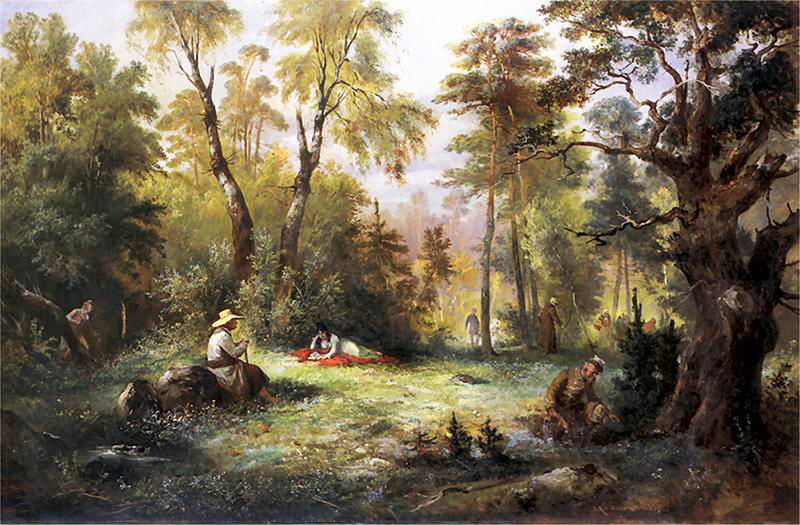 The painting by Franciszek Kostrzewski is an illustration from Adam Mickiewicz's Pan Tadeusz, a national epic which features mushroom picking along with other traditional Polish activities, like hunting. All Saints Day on 1st November (along with Zaduszki, its follow-up the next day) is arguably the most gloomy day on the Polish calendar. On these days cemeteries in Poland are aglow with lights as people visit graves to pray for the souls of their dead. 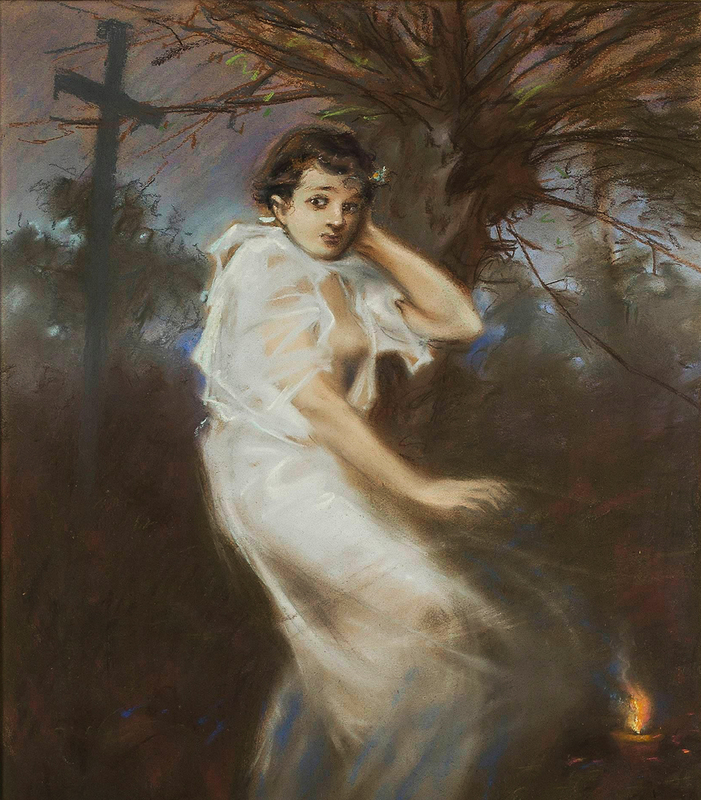 If you're lucky, you can even meet a ghost – a poor, lost soul as the one portrayed in Witold Pruszkowski's painting. You can also find the graves of many famous Poles around the world. Back to the beginning, it’s Christmas again. 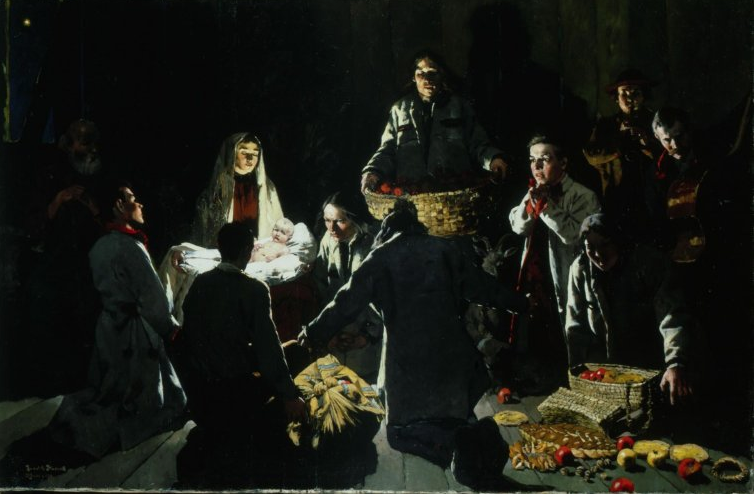 This painting by Ludwik Stasiak portrays shepherds gathered around the manger of the baby Jesus. Late on Christmas Eve, many Polish people will go to a pasterka (‘Shepherds' Mass’) organised in churches at midnight around the country to sing traditional Christmas carols. Indeed, there are many Polish Christmas traditions that have retained their popularity and are a fine way to mark the end of the calendar year.